(2014). Investigating Stability and Solubility Properties of Cyclophosphamide-Functionalized (8,0) and (4,4) CNT Complexes in Water: Computational Studies. International Journal of Bio-Inorganic Hybrid Nanomaterials, 3(1), 49-55.
. "Investigating Stability and Solubility Properties of Cyclophosphamide-Functionalized (8,0) and (4,4) CNT Complexes in Water: Computational Studies". 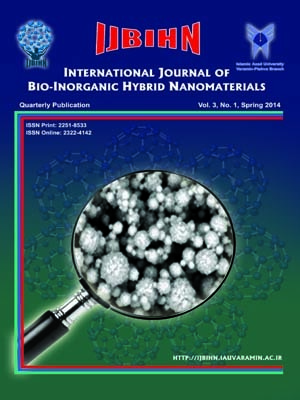 International Journal of Bio-Inorganic Hybrid Nanomaterials, 3, 1, 2014, 49-55. (2014). 'Investigating Stability and Solubility Properties of Cyclophosphamide-Functionalized (8,0) and (4,4) CNT Complexes in Water: Computational Studies', International Journal of Bio-Inorganic Hybrid Nanomaterials, 3(1), pp. 49-55. Investigating Stability and Solubility Properties of Cyclophosphamide-Functionalized (8,0) and (4,4) CNT Complexes in Water: Computational Studies. International Journal of Bio-Inorganic Hybrid Nanomaterials, 2014; 3(1): 49-55. Stabilities and quantum molecular descriptors of cyclophoshphamide (an anticancer drug)-functionalized (8,0) zigzag and (4,4) armchair carbon nanotubes (CNTs) complexes in water were studied using density functional theory (DFT) calculations. Two attachments namely the sidewall- and tip-attachments are considered for the model constructions. Calculations of the total electronic energy (Et) and binding energy (Eb) of all complexes indicates better thermodynamic stabilities for the sidewall-attachment of cyclophosphamide than the tip-attachment. On the other hand, results from chemical hardness show that drug-functionalized (8,0) zigzag and (4,4) armchair complexes in the tip-attachment configuration possess the smallest and greatest chemical hardness, respectively. By computing the solvation energy, it is found that the solution of the drug and all complexes are spontaneous in water. Furthermore, chirality and attachment configuration have no effects on solvation energy of complexes.